Thanks to everyone who tuned into the Home Channel earlier this month to watch the Design For You episode on the Tassels & Tigers lair – also known as my own lounge. The amount of support and excitement from regular blog readers and of course friends and family was humbling and elevating at the same time. For those of you who weren’t able to catch it, I decided to do a summary of the main touchpoints. We spoke about statement pieces, where to find them, and how to make use of layout and colour to create a unique look with the things you already have. Of course we also spoke about the uniquely convenient Tassels & Tigers service, Décor-In-A-Box. Please have a look here, or get in touch for further information on Decor-In-A-Box. You can also start by filling out the obligation free online consultation. This is the type of design board you can expect to receive via email. We also include layout suggestions in the final product. Here are some further examples of design boards. All too often you see homes that have been overhauled by decorators in all new furniture, art and curtains and although these homes may look beautiful, they have a certain stiffness about them. I’m almost too scared to say this, but in many cases, they frankly lack personality. Although these looks may contain detailed little touches and unique finds, they do very little for the space if they don’t tell you anything about the person living in the home. Even if in the rare financial position to throw out everything they have, I strongly advise clients to take a critical look at their old furniture to see if any of these pieces will take on a different look when placed in a different surrounding, or reupholstered. It’s surprising what previously hidden features of an old family chair may come to the fore when highlighted with different colours or just placed in a different spot. Having said this, I’m completely brutal when it comes to pieces that simply don’t work. If, for example, a TV stand or accessory is outdated, but not yet vintage or retro, and a client has no emotional connection to it, it must go. Even a single piece that’s out of place (and I’m not talking about a feature / statement piece), will completely destroy the harmony of the room – something which is precious and hard to achieve. As a result, it’s likely to make one feel a little out of sorts. Just a little more annoyed and a little less at home. Although it’s traditionally considered correct for all the pieces in a room or even a home to hail from a certain design style, we live in an era of freedom. An era where eclectic truly is a style and people can tastefully combine whatever they fancy. The trick to making it look good, however, is to look for similarities in form and size. This can be something as simple as cabriole legs, or deep- or diamond buttons on chairs. Remember, where none of these similarities exist, they can be created with the use of a deep-button scatter, or all new legs on a chair. When selecting a colour scheme, it is important to stick to a recognised, harmonious colour scheme. I try to look at the dominant colour in the pieces a client already has and wants to keep, and then find colour schemes that include this colour, but are still new and fresh. Colour can also be a great tool when tying in pieces that would not ordinarily have gone with the rest of the items, or highlighting a statement piece. Pulling a specific colour through an entire room in little touches, and concentrating it one specific area, creates a harmonious line for the eye to follow and finally come to rest on the piece you’d like to show off. Bringing in larger bits of colour in the rest of the room, on the other hand, will help distribute this colour more evenly, creating balance. Here bold colours, red, white and black, were combined in harmony. Black framed images on a white wall are an inverted, repeated effect of the white images on the opposite black wall. The charcoal tub chairs find balance in the dark grey recovered ottomans under the window and the red tassels and scatter on the couch subtly repeat the dominant red on the carpet. Also note how the light brown on the gallery wall is repeated in the faux fur scatters on the chair and couch and specifically how the black scatter fabric (Goosebumps Col 12 from U&G Fabrics) was chosen for the subtle gold background that echo's both the faux fur scatter and gold curtain tie-backs. When you’re unable to make much use of colour as a binder, either because you want to opt for a neutral look, or there are already too many colours, focus your attention on repeating patterns instead. You’d be surprised how many similar patterns are out there if you take the time to look. A new scatter in damask, for example, will pick up on old damask lamp shades or ottomans even if it’s a completely different colour. And voila, a little bit of harmony is achieved. Here the scatter was chosen for its design, to compliment that of the Elephant Foot Persian Carpet. The throw for the tub chairs further echo's the fabric design and style of the scatter. 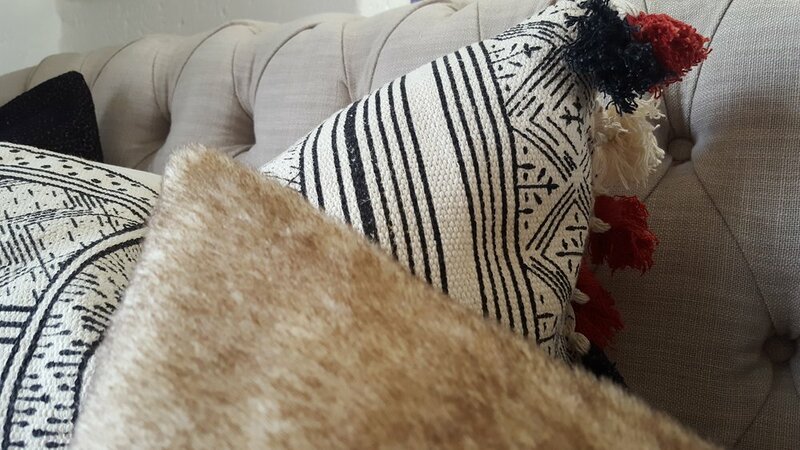 I made slipcovers for two ottomans in Hertex's Recluse, Cobble and used a different colour, Recluse Nougat, to make scatter covers for the couch. These herringbone patters are repeated in the storage basket. This is my personal favourite (and the inspiration for Tassels & Tigers Themed Interiors). I’m theme crazy and get really excited when someone has selected an element, picture or story that speak to them on a deep personal level – even if it’s for no specific reason – and want to work with that. This is anything that makes you stop and take a second look, or that keeps evoking the same warm, exciting emotion inside of you every time you look at it. Once you have this theme in mind, you have a compass to direct your design. It creates a yardstick by which all the elements are measured and also a very flexible tool for incorporating pieces that may not ordinarily have gone with the design. I use the same criteria when selecting statement pieces. Ironically though, it’s not really something you can always go out and find on a whim. It can be anything from a family heirloom or a pawn shop find, to a pricey piece in a designer store. Guided by the same compass you use, it will usually find you when you’ve got your sights set. It’s important to remember though, that a space can only have a handful of feature pieces at the most before the delicate balance and harmony is disturbed. 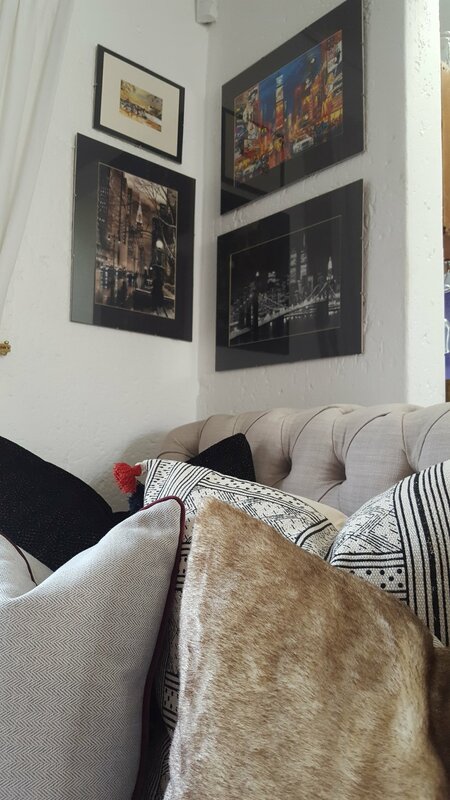 The couch and scatter cushion collection was very carefully designed based on their colour, style and texture. The art collections, however, were all old: a collection of family artworks, travel purchases and unique finds that spoke to us when we saw them. Here it is the grouping and placement that matters. Note how the colourful chair serves as transition between the mostly neutral lounge and colourful kitchen, while the sketches were framed in wood that matches the wood carvings. If you need some help to put together your existing pieces - get in touch with me for an online or face-to-face consultation. I can also custom make scatters, curtains, couches and slip covers for you.